After a whirlwind tour of the Art Institute of Chicago and the San Francisco Museum of Modern Art, Peter Fischli and David Weiss’ Snowman (2016) has now taken up a long-term residency at the Museum of Modern Art in New York, as part of the outdoor exhibition If Everything Is Sculpture Why Make Sculpture? Artist’s Choice: Peter Fischli. Kept cool inside a glass doored freezer installed in the museum’s sculpture garden, the frosty figure visitors see today is actually the younger brother of a site-specific 1987 commission for a power plant in Saarbrücken, Germany, which provided the continuous flow of energy needed to create the work. Cara Manes, the assistant curator of MoMA’s department of painting and sculpture, says the piece raises complex questions about climate change, both as a commentary on energy use as well as a contradiction, since the work itself could be seen as a contributor to global warming. 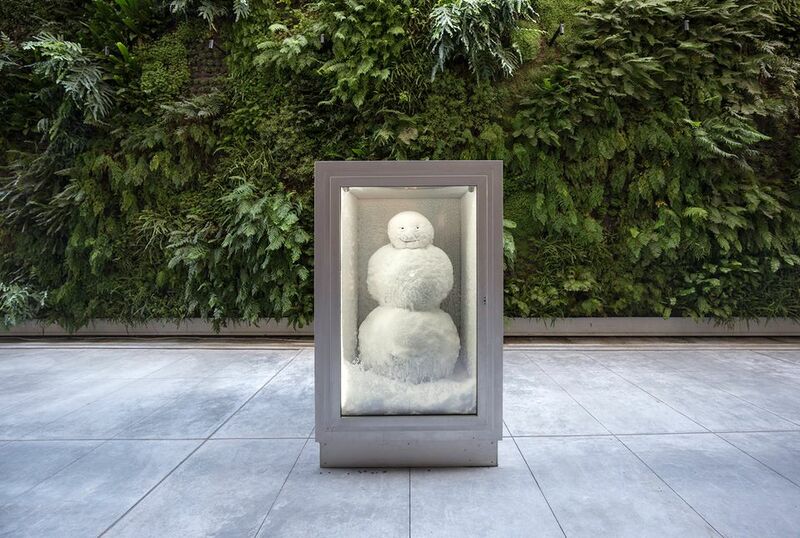 And while the Snowman’s eternal smile from behind his glass freezer door may start to seem smug to visitors through what is sure to be another long, humid city summer, he is due to stay in place throughout the fall and winter, when chillier temperatures could create a sense of more camaraderie.